On May 7, 2012, John and Starla Cassani presented the Colby Cassani Endowed Lectureship Series (CCELS) to the Kansas City University of Medicine and Biosciences (KCUMB) and made a $4,000 contribution to the school. The Cassanis, along with others, presented a half day lecture to 250 first year medical students, and were able to include third year medical students by video conference. 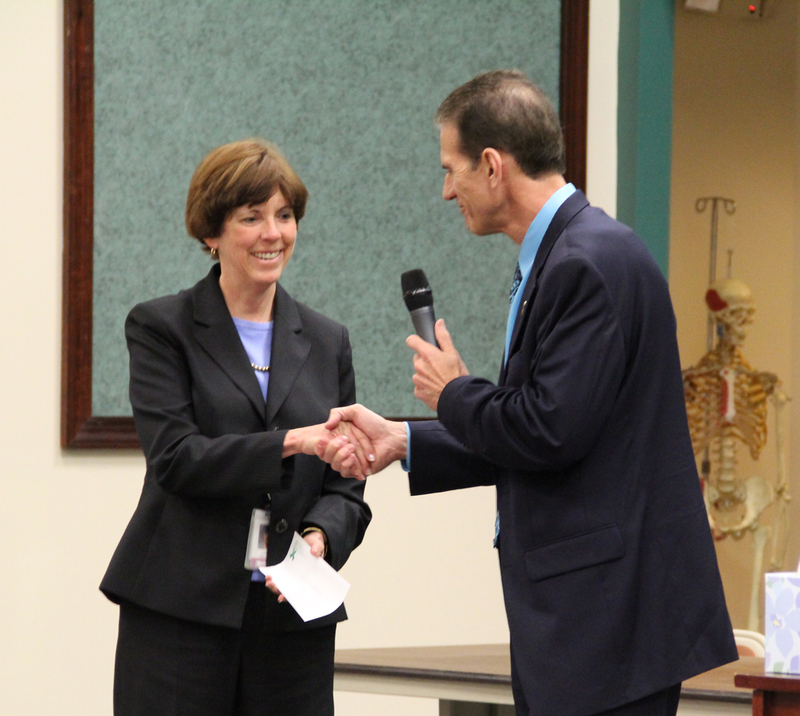 John Cassani, Colby Foundation Trustee, presented a $4,000 check to Linda Adkison, MS, PhD, Associate Dean of Curricular Affairs, Professor of Genetics Kansas City University of Medicine and Biosciences. The presentation began with Starla and John sharing their story about the tragic loss of their one year old son, Colby, in 1993. While grieving, they found a measure of hope and healing through donating his organs. In 1995, they started the Colby Foundation to honor his memory and to educate others about organ and tissue donation and transplantation. Since then, the Colby Foundation has established this endowed lectureship series (CCELS) at seven medical schools across the country and, in the near future hopes to add an eighth. The Cassani‘s presentation was followed by Mark G. Reintjes, MD, FAC, Medical Director of Midwest Transplant Network. Dr. Reintjes, a kidney transplant specialist, spoke on organ donation, kidney transplant surgery and histo-compatibility. Dr. Karen Hardinger, PharmD, BCPS, Clinical Associate Professor of Pharmacy Practice from Kansas City University of Missouri, provided a presentation on Medical Management/Immunosuppresive Therapy. The final speaker was Ray G. an organ recipient who has had two heart transplants. The lecture was very well received by the students, faculty and those present. At the end, an electronic survey was provided to the students. The outcome of this survey can be found here. The opening given by Starla Cassani and the patient presentation by Ray were excellent. I thought Starla Cassani's speech was the most interesting, because she talked about the emotional processes going on with donor families and coping with the loss. That's something we won't get as much training in on rotations or in residencies. The speakers added insight and open my eyes to transplant information that I didn't know before. The presentation is excellent. It motivates me to want to advocate for organ donations and consideration of being a surgeon. I am also currently not an organ donor and it made me think about signing up so I can possibly save lives. I thoroughly enjoyed the lecture series today. I I feel that organ donation and transplantation is a very important topic that not only medical students should learn about but should also be shared to the public. I applaud the Cassani family for turning the tragic death of their son, Colby, into a lifelong calling of spreading the word on organ donation and how we can all choose to give the gift of life. On April 26, 2012, the Colby Foundation staged it’s first fundraiser at Napa Sonoma Grocery Company in Reno, Nevada. It was an enormous success thanks to all our guests and sponsors who were very generous. Our heartfelt thanks go out to our sponsors Dennis and Susan Banks, Banks Construction, for donating the food and Napa Sonoma as the event site; John Klacking of Double Bond Winery for donating his Double Bond premium wines, and the Eldorado Hotel Casino for contributing 42 bottles of wine for our raffle. Many other companies donated raffle prizes which allowed us to raffle off a total of 55 prizes! Over 80 people attended; there were organ donors and recipients, friends, and many from the community who support Organ and Tissue awareness. We raised nearly $5,000 to support the Colby Foundation. The organization’s mission is to increase awareness of organ and tissue donation and transplantation in the national community while the CCELS specifically educates medical students and health care professionals in the compassion, humanism and ethical standards involved in this mission. Thank you all for your continued support of the Colby Foundation and the gift of life. If you would like to contribute, please click here to make a contribution online now. Advisory Board: The Colby Foundation held it’s first Advisory Board meeting in March, 2012. The Advisory Board Members are: Jim Bauserman, the Bauserman Group, Dr. Hersey Bell, Lake Erie College of Osteopathic Medicine; Bob Enzenberger, Robert F. Enzenberger Law; John Klacking, Double Bond Winery; John Solari, Solari & Partners, CPA. During the first meeting, the group reviewed the history and budget of the Foundation. They discussed strategies for marketing and fund raising opportunities and ways to achieve the Foundation’s mission. With the help of the Advisory Board, the Foundation will continue to grow and prosper. The Advisory Board next meets on June 26, 2012. Trustees Notes: Data-Scribe Grant: The Colby Foundation is pleased to announce it has received a grant from Data-Scribe that will allow us to expand our website and social media program. Data-Scribe will match the Colby Foundation’s expenditures dollar for dollar to a maximum of $10,000. We will provide additional information in the next quarter’s newsletter as to the additional upgrades this will bring to the Colby Foundation website. NV Business Magazine Award: The Colby Foundation is very pleased to announce it has been named the recipient of the 2012 Northern Nevada Healthcare Heroes Award for non profit organizations. There will be an awards dinner on August 2, 2012 at the Silver Legacy in Reno. Proceeds benefit students pursuing careers in healthcare education. Healthcare Heroes is co-sponsored by NV Business Magazine and Anthem Blue Cross Blue Shield of Nevada. Have you already joined us on Facebook? Click the icon to "like" us on facebook! Stay informed. Add to the conversation. And spread the word!